Looking for anchor ropes/lines, then look no further. 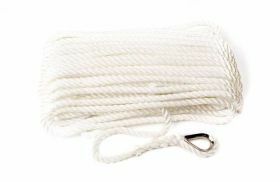 We hold a huge stock of white 3-strand twisted nylon anchor ropes and anchor lines. These anchor ropes are pre-made or pre-spliced at one end with a galvinsed rope thimble and the other end has a soft eye spliced into the rope. They are suitable for all boats, yachts, kayaks and jet-ski's. W supply them in 10mm, 12mm, 14mm, 16mm and 18mm diameter or thickness in pre-made lengths ready to go.